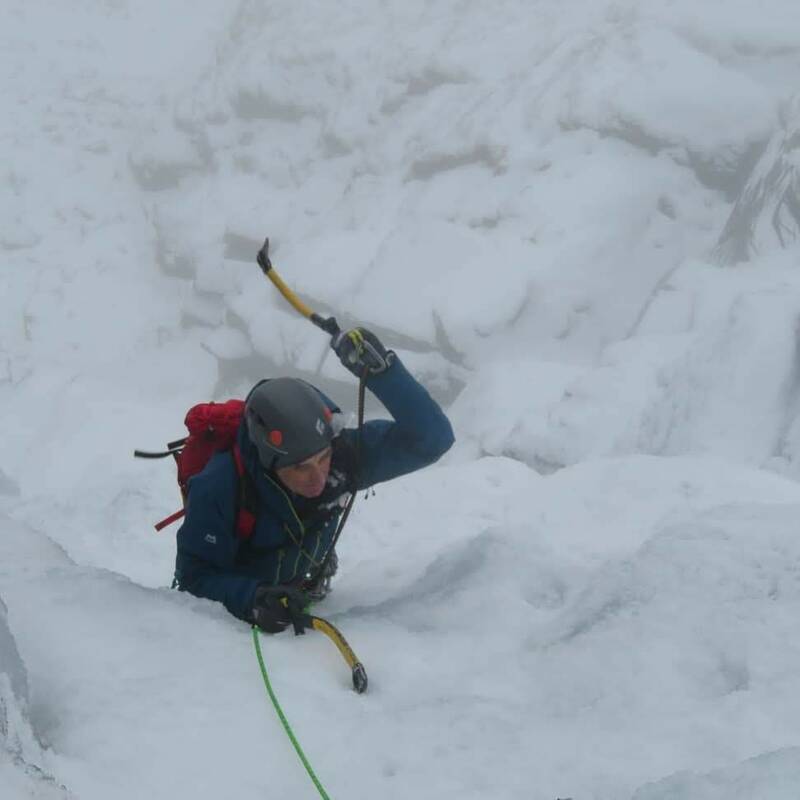 Typically, early season climbing can be higt and miss but if you don't try then you wont know. Alan (71) was keen to get it off to an early start so we opted to dust off the crampons and hit the snow in Glencoe. To my delight, Alan hadn't done Dorsal Arete (II) so I felt this would be a good start to the season. The snow was really soft but as always the climbing was good. The turf underneath the snow was generally ok but if you pulled too hard on the axes then you may pull some soft turf out. Good thing we have 70 years of climbing experience between us! A team followed us up and they opted to not wear crampons. They made it to my delight! At the fin, we opted to go around the right. On the day, Alan wasnt up for the 'teetering across the top' moves which is a very good decision. Know your limits and don't rush in. Going around the right gave a nice tricky corner to climb and far more enjoyable. After a good study of the forecast it looked like we were going to have to climb high. 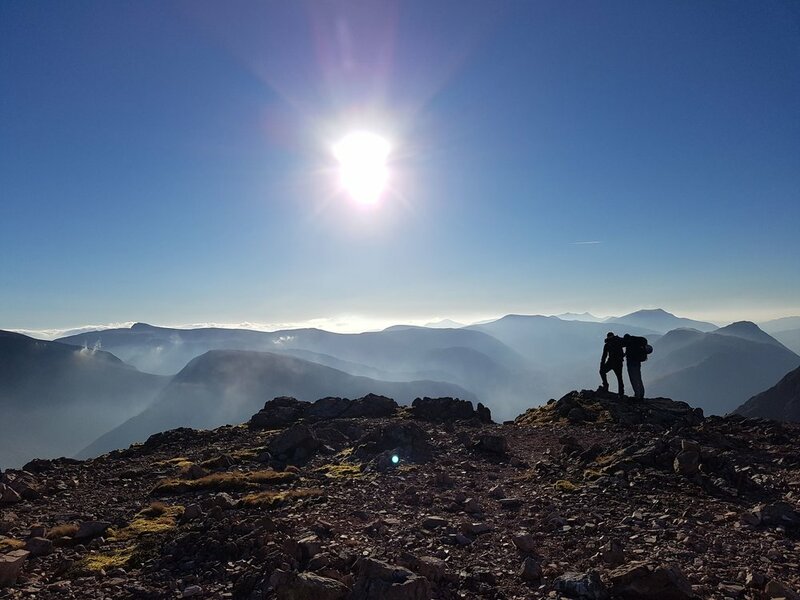 As two became three, then three became four, we had a very sociable team with plenty of motivation to share around...which is exactly what you need for the walk into the North facing cliffs of Stob Coire an Laoigh. I was super keen for the three star route 'Some like it hot'. I have climbed the other classics of the crag such as 'Taliballen' (V,6) and Centrepoint (VI,7) and knew that, if I was too come back in here, I would climb 'Some like....'. My friend Kenny and I have talked about this route pretty much every year for the last 8 years but never got round to doing it. A quartzite wall! 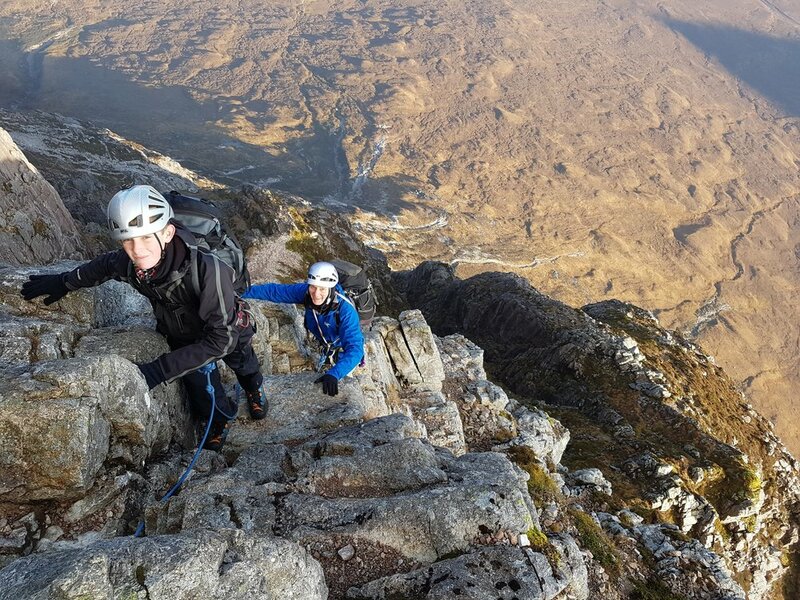 Some of the best climbing in Scotland is on quartzite! So Lou, Steve, Andy and myself left Spean Bridge at 0645 and drove up the track past Corriechoille Farm (beware of pot holes) to set off walking just after 7. The walk felt like it went on for hours but on arrival to the corrie, a mere 2 hours had passed. Just after nine, we were presented with a perfect looking crag! We split in our teams. Lou and I headed for 'Some like it hot' and Steve and Andy headed for 'Centrepoint'. We wondered what we would find. The ground was sodden on the walk in which allowed some doubt about conditions to creep in. The first swing of my ice axe confirmed that we were on! It was only going to get better and the turf was good! Lou remembering how to winter climb, didn't take her long! As this was Lou's first trip out this winter, I led both pitches which were quite contrasting but equally brilliant. P1 (VI,6). Pitch 2 (VII,7). With only two pitches to climb we topped out in pretty good time. We wandered over to see Steve and Andy in action, just as Steve was leading off on the 3rd and final pitch. A two hour walk out which required head torches for the last 20 minutes concluded a great day and a good early season route. Right back to work tomorrow in Glencoe! Steve and Andy are there somewhere on the steep 'Centrepoint'. For me, the Scottish winter season will come to an end very quickly. I am due to be in the Alps from mid December until April. So my intention is to cram a seasons worth of climbing into one month! Is it possible? Doubtful! However, if last year is anything to go by, I only have to do 6 more routes then I will beat that tally! So, two routes have got me underway. Last year on the 25th November, Chadders and I climbed on Carn Etchican. This year, on the same date we did exactly the same. We only realised when we were home as it popped up on Mark's Facebook feed. The photo's are not identical but very similar. Check them out in the link above. We had a few route's in mind, one objective was black so we needed to stick to something that was holding the snow, a groove or gully line. So we ended up on Pagans Slit (V,6) which gave some brilliant, balancy, turfy climbing. Everything was frozen and we weren't wading through too much snow. It's was bitterly cold though...I just wonder if I haven't adjusted to it yet after my sport climbing trip or if I am just being a bit soft!? It was a tough day in terms of braking trail, wandering through boulder fields with some snow, falling down holes and getting battered by the wind. Im glad the following day was due to be a short one. Before I could go climbing for myself, I was out working with Grahame who has some gift vouchers to redeem. Great present idea from his brother! We had planned for 3 days but unfortunately the weather didn't play ball so we just had two. Great fun as always. Day one we did a couple of corbett's Grahame hadn't done, Cruach Innse and Sgurr Innse, after an aborted effort to get to the Forcan Ridge, due to road closure. The Grey Corries are great hills on the doorstep and it was great to get a view of them from a new angle. I think he might have a taste for winter! Unsure of ideas for Christmas presents for friends and family? Get in touch so they can open a day of adventure in the mountains! An interesting season has come to an end. Many great days on the hill with brilliant people and made some great memories and friends. I'm super pleased that my last day of work this winter was in fact very wintery. It felt we finished on a high. We had great weather on the Aonach Eagach and made a modest car to car trip in 7 hours of trench warfare. Our last day out was on Curved Ridge and we didn't even touch snow and that was in late January! So we got our quota today. A fitting end to the season and now time for the next stage on my journey to becoming a IFMGA guide...Ski Touring Training. The sun is coming through!